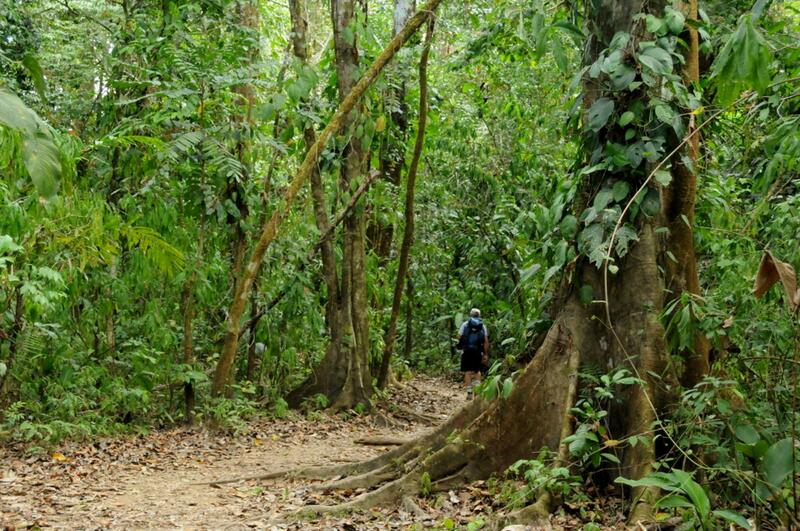 The hike to San Pedrillo Station will take you through one of the most ecologically diverse forests in the world. This tour departs from Sierpe and you will enjoy a 30-minute hike to the San Pedrillo station in Corcovado National Park. The hike covers 1.8 miles (3km). There are over 400 types birds in this dense, leafy forest. Your guide will help you look for them. There’s also a good chance that you’ll see several different types of monkeys, and army ants that cut a ferocious path through the forest. On this hike, you’ll get to see the San Pedrillo Waterfall, which has a plunge pool where you can swim. As you walk, your guide will point out some of the area’s interesting plants. Indigenous peoples use The “Leche de Vaca” tree to cure ulcers. You’ll also see the Walking Tree, which is a type of palm that can grow new vertical roots if it gets knocked over, thus giving the impression that it “walks” across the jungle floor. Comfortable hiking shoes, bird identification manual, breathable hiking clothes, a water bottle, and insect repellent. Guided tour and transportation from Drake Bay. "A must do activity for anyone visiting this area. It would help to know more about this hike ahead of the holiday though. Many of us were a little caught out because we didn't know about the details - like crossing rivers and walking sections without hiking boots"
We were met at 06:00am at our lodge (Pirate Cove) by Gabrielle, who was our guide for the next 8 hours. He was excellent and started his guiding 5m from the Lodge describing plants and birds as we made our way down the wooden steps to our boat on the beach below. The boat ride to and from Corcovado Park took about 30 minutes. Apart from the detailed descriptions of all of the plants we passed, we saw many creatures up close, the most notable being Scarlet Macaws, a three-tied sloth with her baby, Ospreys, Black Hawks, Oyster catchers, coati raccoons, spider monkeys with their young, capuchin monkeys, a 2m crocodile, a 1.5m green vine snake, a tiny (2.5cm) poisonous rocket frog, spiders, bats, a Curassow, ... , ... At about 11:00am we arrived back at the San Pedrillo ranger station for a drink and some nourishment before heading up a creek along a rough track to a pretty waterfall and a most welcome swim in a natural pool to cool off from the almost 100% humidity within the creek. Before being picked up for the boat ride back to our lodge, we had a very substantial picnic lunch interrupted by two spider monkeys and their two young swinging around as they ate mangoes in the trees above us. A great day out. If we were to do this again, we would have stayed over night at the park and engaged more in-depth exploration of the wildlife of the area. The tour was good, but we would have like more time. It was a bit rushed. But we are nature enthusiasts.